Today I got to meet Seamus Heaney. My favorite Irish poet. Scratch that, my favorite poet. Of all time. Ever. He’s kind of a big deal, and he’s at Emory for a fundraiser for our library. I don’t get to go to the fundraiser (which is tonight) because it costs a lot of dollars. But he’ll also be reading tomorrow at a free event because Emory is cool like that, and I’ve been looking forward to that for quite a while. I thought I would never get to hear him give a reading. This weekend, the American Conference of Irish Studies (south) is happening here in Decatur (I’m presenting a paper at the conference tomorrow), and today’s conference luncheon and keynote speaker were at Emory in the library. In lieu of meeting at our regular time this week, my Irish lit class attended this event. 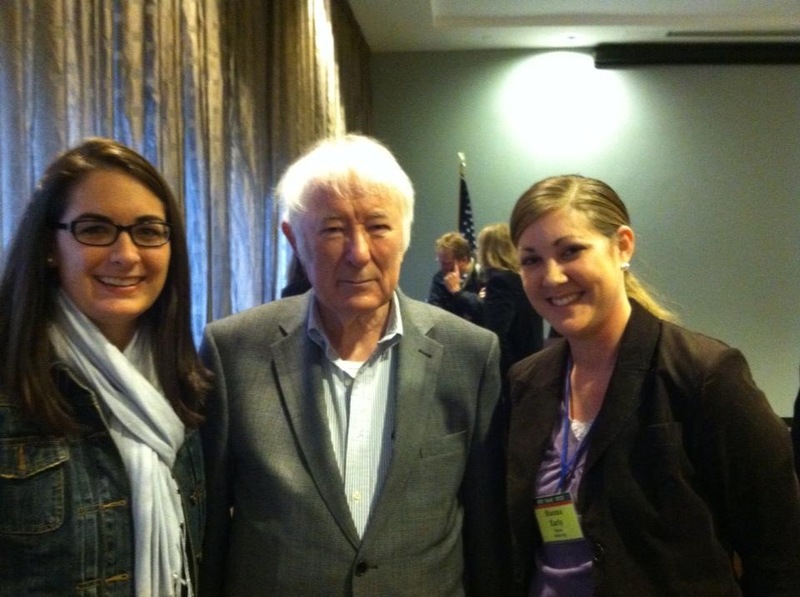 So, there we all were, eating and waiting for the keynote to begin when Heaney walked into the room. He’s friends with the speaker, Professor Schuchard, who is retired (or semi-retired?) Emory faculty, so that’s probably why he came. Anyway, after it was over, I was kind of hanging around trying to find enough courage to go over and just meet him because it’s almost guaranteed that I’ll never have that opportunity again. Well, I was on the verge of chickening out when I decided that maybe I could just go over and meet Professor Schuchard, whom I’ve been meaning to meet for a while now (because he is an important Irish lit scholar) and since the two men were standing pretty close together maybe I could use that momentum to sort of propel myself in Heaney’s direction. And my friend Molly agreed to come over with me, so after we introduced ourselves to Professor Schuchard, we nervously moved over behind two other women who were speaking to Heaney, and tried to decide what to say to him. And then the other women asked us to snap their photo with the poet, and we did and then we asked them to do the same. I was a little star-struck, y’all. I don’t think I said anything but hi and grinned like an idiot, but what a moment! And to have a photo! Just after this, I wandered over to a nearby part of the library where they had set up a small gallery of photos of Heaney from the archives (probably for the fundraiser tonight). Most of the other conference folks had gone up for a tour of special collections, so no one was at the gallery when I got there. And then my Irish lit professor and a couple of other people came over to the gallery with Heaney and his wife Mary. So I wandered through the gallery with them, and the Heaneys reminisced about the photos—where they were taken, what was happening, etc. And Heaney looked at me and smiled and said something about how young he was in one of the nearby photos. I think I grinned and nodded and said something really cool like “Yeah.” It’s times like these that I wish I wasn’t shy. But that’s okay. I’m pretty pleased that I was brave enough to just go over there in the first place, and that Molly came over with me because I might have chickened out on my own. And, of course, grateful for the whole experience. Also, for those of you keeping score at home, this makes two really important writers I’ve met in the past two weeks. I’m feeling pretty good about my decision to come to Emory right about now. What a great experience! I now have some poems to go read in order to celebrate with you from a more educated perspective. One question, must I read them with an Irish accent for full effect? Because I’m totally up for that.